Akbar Gbajabiamila, who joined the Board of Directors of The Michael J. Fox Foundation in March, is an NFL alum, sports commentator and entertainment personality who currently hosts NBC’s Emmy-nominated “American Ninja Warrior” (ANW). As the son of a father diagnosed with Parkinson’s two decades ago, Gbajabiamila was riveted when he saw Jimmy Choi, a 41-year-old Chicago resident living with Parkinson’s, run the ANW course in summer 2017. The two became fast friends, and as “Fox Ninja,” Jimmy has become a crowd favorite of the show, returning for a second buzzer attempt in Indianapolis. Inspired, Akbar has committed to use his national Ninja platform to share the impact of his father’s own Parkinson’s journey — and to rally PD patients and families nationwide to be part of the research revolution under way in Parkinson’s drug development. 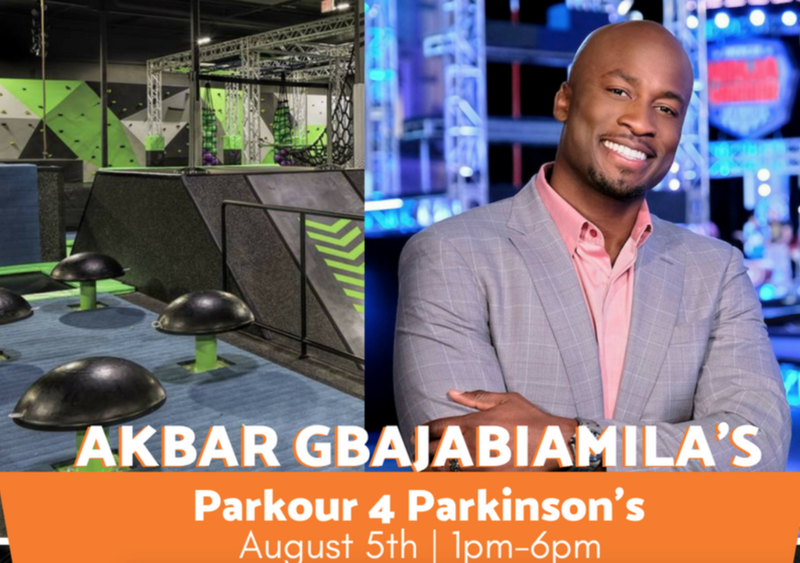 Hosted at DojoBoom, Los Angeles’s premier trampoline gym, Gbajabiamila’s “Parkour 4 Parkinson’s” invites family members of all ages and all experience levels to jump and parkour on a Ninja Warrior- themed course in support of a cure for the disease. The event will feature special appearances by top Ninja Warrior athletes, food, family-friendly activities and a virtual auction with big-ticket packages to go behind the scenes with NFL teams. Gbajabiamila joins a committed group of fellow MJFF Directors who are members of Team Fox, the Foundation’s grassroots network of community fundraisers. Team Fox members raise millions of dollars annually, with 100 percent of proceeds going directly to MJFF’s cutting-edge research programs to speed a cure for the estimated 6 million people worldwide living with Parkinson’s disease. Event registration is $75 per person, for both adults and children, and grants the jumper one hour of full access to the gym and the fan area. VIP registration is $175 per person and grants the VIP jumper exclusive time on the course with top Ninja Warrior athletes, a swag gift bag, and an invite-only reception. Tickets are limited and can be purchased now at teamfox.org/akbar.